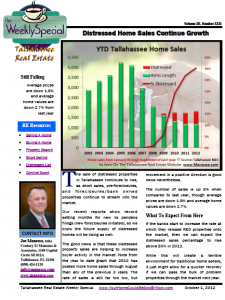 Tallahassee home sales are finally on the rise, with 2012 now better than any year since 2008. 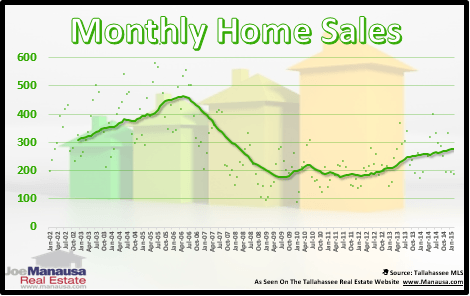 In fact, Tallahassee home sales are up 5% over 2011, and we are seeing signs that we should finish the year up even better. When we look at the real estate graph below, we see that Tallahassee home sales through September are up marginally over the three previous years. The benefit of studying a year-to-date graph is that each year shows the same periods of time. 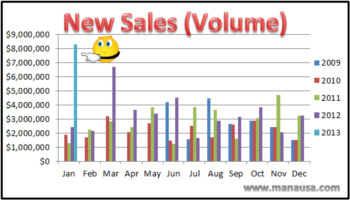 The blue lines in the graph above record all home sales in the Tallahassee MLS from January. Home values (shown in red and measure in price per square foot) have declined just under 3% from last year, continuing the depreciation trend that began in Tallahassee back in 2008. Unfortunately, the majority of the growth in Tallahassee home sales comes from short sales, foreclosures, and bank owned properties. 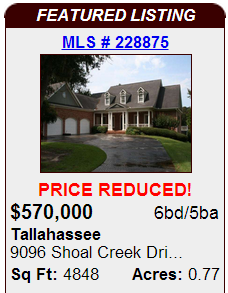 If you read this morning's weekly special report, then you know distressed properties are the fastest growing segment of the Tallahassee real estate market and currently represent more than 35% of the properties closed in 2012. We know this segment of the market will continue to grow in 2013, and our report covers what this strengthening market dynamic means for people who want to sell their homes in a traditional manner. The key is to understand the market for your specific home, and how all the distressed properties for sale in Tallahassee are going to affect your ability to sell. If you are thinking about selling a home in Tallahassee and want to know how you can gain a competitive advantage, you should use our complete market analysis for your home. In order to do so, simply drop me a note and we can schedule a time to review your specific situation and see how your home will compete among other Tallahassee home sales.